OfficeTimer provides few pre-defined holidays type such as US, UK etc. Administrator can define the holidays as per their organization rules & region by creating new [Holiday Type]. 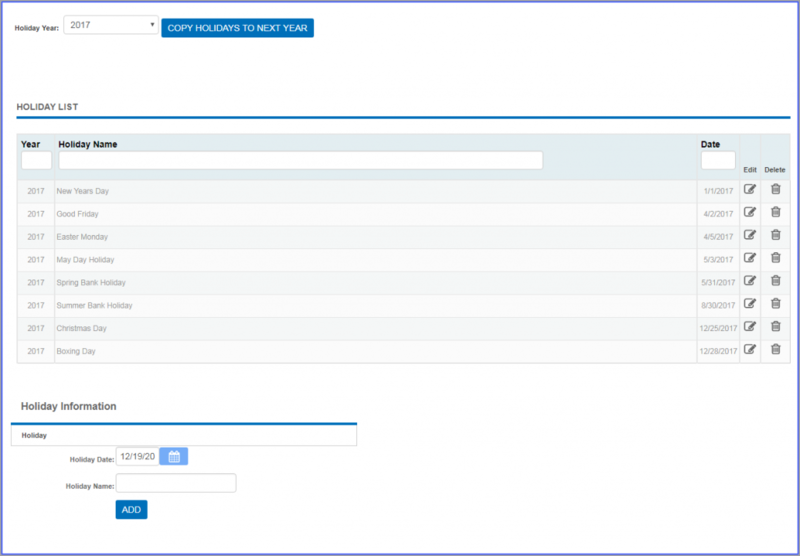 The administrator can create [Holiday Types] with different configurations and can assign these types separately to each individual employee. The administrator can also select pre-defined holidays comes by default with OfficeTimer. Following settings can be configured using Holiday options available in OfficeTimer. OfficeTimer comes with different pre-defined holidays set. Administrator can select those pre-defined holidays set from[Admin Options]–>[Holidays]. Once selected pre-defined holidays, administrator can fully edit those holidays types in[Admin Options]–>[Holiday Types]. System administrator can setup holiday types policies using[Admin options]—->[Holiday Type]. Enter new holiday type in[Holiday Type Information]form which you want to add. Click on[Add]to add this[Holiday Type]in OfficeTimer system. In[Holiday Type List], click on[Delete]link of record which you want to delete. In[Holiday Type List], click on[Edit]link of record which you want to modify. Update your required modification in[Holiday Type Information]form. Click on[Holidays]link of[Holiday Type]in which you wish to define holidays.